I have always recoiled when I hear that Viceroy butterflies ‘mimic’ Monarch butterflies. It’s true that Monarch caterpillars eat milkweed leaves, and the glycosides that are highly concentrated in the milkweed remain inert (unchanged) in the Monarch caterpillars, and the Monarch butterflies that eclose from Monarch chrysalises are fully stocked with those very same, disgustingly bitter glycosides. We are taught that this adaptation of the Monarchs provides them with excellent protection from predators. 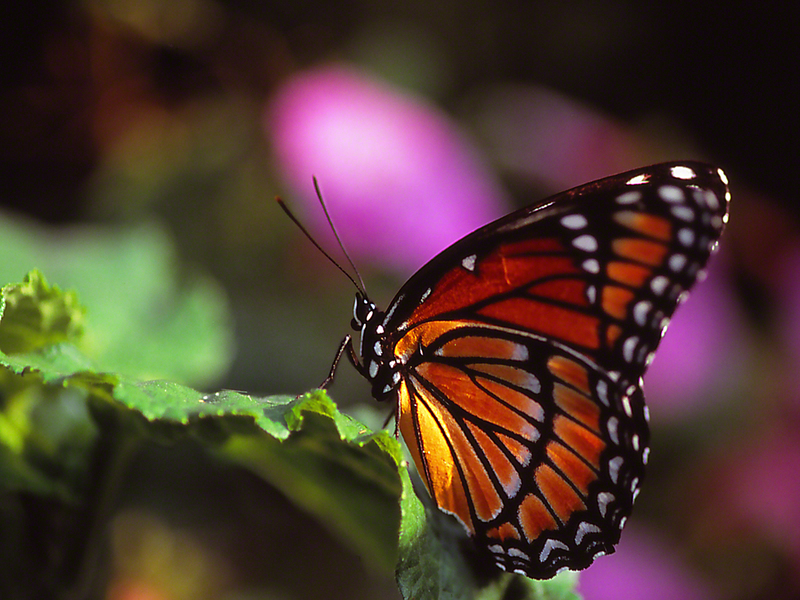 It may or it may not be true that selection has caused the Viceroy butterfly to closely resemble Monarchs. Either way, birds learn early that this look signals, “Leave alone, don’t even try to eat!” Experience has convinced that Viceroys like this one, show zero wing damage from birds (bird-struck), because the birds’ mommies taught them early, avoid that sort of butterfly, or retch uncontrollably should you forget that lesson! That band of black, across the middle of the hindwing of this Viceroy, enables you to ID as a Viceroy. Time in the field also teaches, Monarchs fly high, with elegant wing strokes, while Viceroys fly more like jet fighters, fast and with much diving and soaring, yet always some 8 feet or so above the ground. Monarchs Love to nectar on flowers, Viceroys rarely are seen upon flowers. Viceroy butterflies do not treat us with one of our biggest life mysteries, that is, How do Monarch butterflies, that have never been to central Mexico, fly from Maine, New York and Ohio, thousands of miles, to the mountains of central Mexico?? Viceroys have their own charm. They are less commonly seen than Monarchs. They prefer to be close to their hostplants, Willow trees and shrubs, which puts them in the neighborhood of wetlands (marshes, swamps, ponds & lakes, and wet meadows (fens)). That fascinating habitat includes cattails, red-wing blackbirds, Baltimore checkerspot butterflies, aquatic turtles, muskrat and beaver, birders seeking sightings of egrets, herons, rails, storks and ducks. Poetic places that when found, protected from billionaires and developers, tickle our imagination and treat our eyes. It also puts Viceroys, here in the Southern USA, at home with alligators, as we saw in Laura’s Harris Neck National Wildlife Refuge (Georgia) and in Neel’s St. Marks National Wildlife Refuge (Florida). This Viceroy here, seen in the Butterflies & Blooms Briar Patch Habitat in my Eatonton, Georgia, affirms what some Butterfly field guide authors share, that the southeastern Viceroys are especially handsome, decked out in the stronger, more vivid oranges, black and white. Understudy, the Viceroy? Nope. An authentic American Idol, no doubt about it. What a coup! A male Anthocharis Damone Syra butterfly, protected because of its scarcity, in the Upper Galilee region of the HolyLand, Israel. I very much wanted to score an image of this richly colored butterfly, and I met them in March 2012 and again in March 2015. Images shared in field guides often disappoint, for in the printing, color usually loses its real life richness. I’m sitting here with an Israeli field guide for butterflies, and the images of this Anthocharis is not only washed out looking, but it’s an image of a pinned, collected butterfly. My images are shot with Fuji Velvia slide film, and I do that for, I am told, I’m a purist, and want real-time color. The image here very much approximates the hues of this butterfly that I saw on Kedesh trail, south of Kiryat Shemona, in the uppermost Galilee. Our next chance to revisit Israel’s Galilee and Golan regions (lush, green and hilly to mountainous = not the arid desert some imagine when they think of Israel) may well be in May or June of 2020. Hey, did you notice that sharp little purplish bloom in the right of the image? How To Respond To A Special Image? Each time I am to choose a new image to post onto wingedbeauty.com, I open our Media Library and review the 1,000 or so images that reside there. Twenty four years of images return the favor, and I begin to enjoy a soup of thoughts, washed in memories recent and not so recent. I took them all, and they remind of the time I badly wanted an image on a tiny backroad, layed down to capture it Macro-, only to hear a vehicle approach. My legs? They were laying beyond the berm of this dirt road, exposed. Decision? I chose to take the image. The vehicle came and went, and I still have both of my legs and feet. Men! Of all of the times that I went off trail in Israel, the HolyLand, trying for butterfly images. There are vipers in the Middle East that aren’t found in the USA. People die there, from venomous bites. Some of my Media Library images recall such foolishness on my part. Other images, like this one, of a Baltimore Checkerspot, enthrall me. I love this image, and I am much pleased that it is my image. This Baltimore is, choose the word? Gorgeous? Amazing? G-d’s creative work? A stunner? It tickles me that we have a bunch of ‘special images’ now. The years have gifted us with those of Monarchs, Northern Pearly-Eye, Viceroy, those coupled Eastern Black Swallowtails, Question Mark, that Maniola in Israel, and Mourning Cloak. I like writing this, for I’ve done this for years, years of encouraging myself that it is vital work for me to do, to feed the esthete in me, and to share among G-d’s finest works. How many Palamedes Swallowtails did we see those 5 days in Florida’s Big Bend Wildlife Management Area? I’d say 65 to 75 Palamedes. Spicebush Swallowtails? More than 5 Spicebush. Tiger Swallowtails? A good 10 or so. Georgia Satyrs? Some 15 or more. What I think were Zabulon Skippers? Probably 20 Zabulons. Viceroy Butterflies? About 20 Viceroys. When I saw my first Gulf Fritillary, on our 4th day in the field, I was triggered. April 11, 2019, in the Florida Panhandle, and all we’ve seen was one (!) Gulf. When we climbed back into our truck the next day, April 12th, our Gulf Frit counted stood at that one Gulf Fritillary. Sunny, days, highs by 1:30 PM reaching 81F, and just that one Gulf. The Plan always impresses me. There is complex timing for all you’d see in such a destination as Big Bend WMArea. Regretably, the No-See-Ums (Sandflies ?) seem to resist such restraints. This sweet Gulf here was seen in 2018 at Harris Neck National Wildlife Refuge along the Georgia coast in August, where there were then, legions like him, on the wing.